Over-the-shoulder beer holder. Liquid lunch box stores a vertical stack of cold ones in the insulated sleeve, plus a bonus can on the koozie-enhanced shoulder strap. Locked and loaded, but mostly loaded, the Burton Beeracuda is the ultimate over the shoulder beverage holder. Over-the-shoulder beer holder. 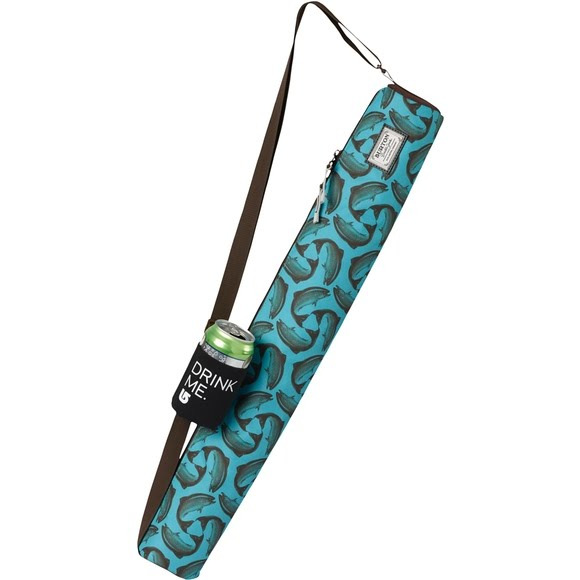 Liquid lunch box stores a vertical stack of cold ones in the insulated sleeve, plus a bonus can on the koozie-enhanced shoulder strap. Locked and loaded, but mostly loaded, the Burton Beeracuda is the ultimate over the shoulder beverage holder. It&apos;s full of technologically complex features like the ability to hold multiple cans at once and the application of gravity to hold it securely to your shoulder. Koozie up front keeps one additional piece of ammo within immediate range of your muzzle.